Ofici�ln� lineup leto�n�ho festivalu Castle Party 2012, uv�d� vystoupen� Depressive Disorder na 28.7.2012 od 15:00h. Dal�� informace na Castle Party 2012. 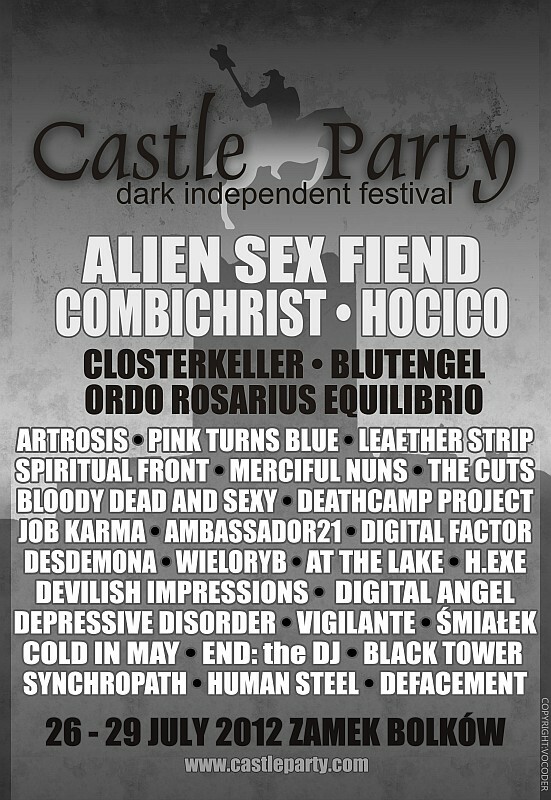 Official Lineup this festival Castle Party 2012 states production Depressive Disorder to 28 July 2012, 3 pm hours. More info Castle Party 2012. Live: "Nosferatu Night No.9 | 21st April 2012"
Dev�t� narozeniny goth shopu Nosferatu, prob�hnou 21.4.2012 v pra�sk�m klubu Rock Caf�, kde vystoup� n�meck� kultovn� formace Dance or Die, ital�t� Latexxx Teens a Depressive Disorder. Afterparty bude v re�ii DJ Chris L.
Vstupenky lze zakoupit v s�t�ch Ticketstream, nebo p��mo v prodejn� Nosferatu. Ninth birthday goth shop Nosferatu, will take place 21. April 2012 at Prague club Rock Caf�, where the German cult band Dance or Die, Italian Latexxx Teens and Depressive Disorder. Afterparty will feature DJ Chris L.
Tickets can be purchased in networks Ticketstream, or directly in the shop Nosferatu. Live: "Depressive Disorder 10 Years Of Electronic Addiction | 4th February 2012"
10 let existence, oslav� Depressive Disorder 4.2.2012 v brn�nsk�m klubu Faval Music Circus Club. V�ce informac� pozd�ji. 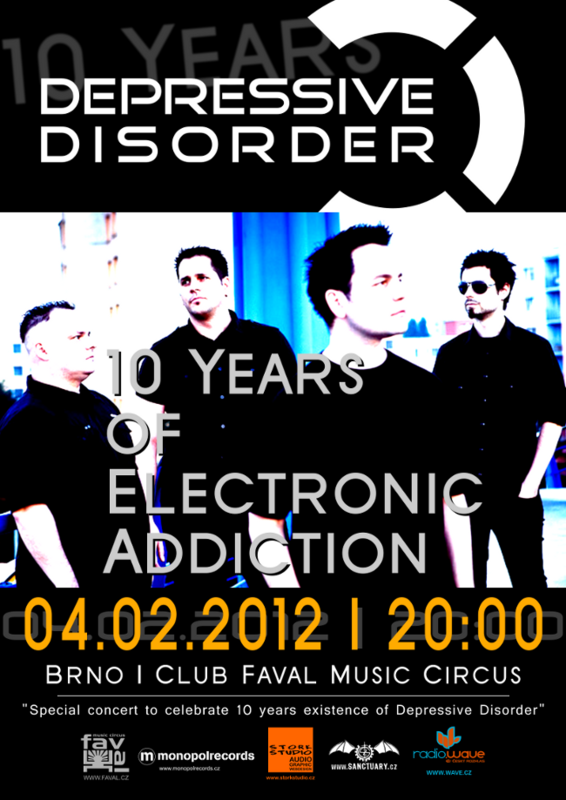 Depressive Disorder celebrate 10 years existencion 4th February 2012 in Faval Music Circus Club Brno. More info leter. O vydan�m DVD "Insane For You", nejbli���ch pl�nech a d�n� v Depressive Disorder, poskytl Patrik s Radimem exklusivn� rozhovor pro R�dio Wave, kter� se vys�lal 16.11.2011, v po�adu Dark Wave. Poslechnou si ho m��ete zde. The edition DVD "Insane For You", coming events in the plans and Depressive Disorder, provided Patrik with Radim exclusive interview for Radio Wave, which aired November 16, 2011, the Dark Wave. Listen to in here. Hudebn� port�l Musicserver.cz, vyhl�sil sout� o DVD Depressive Disorder "Insane For You". Sout�n� kv�z m��ete vyplnit zde a do n�d�le 27. listopadu 2011 odeslat elektronicky na adresu redakce Musicerveru.cz. Pravidla sout�e najdete tamt�. 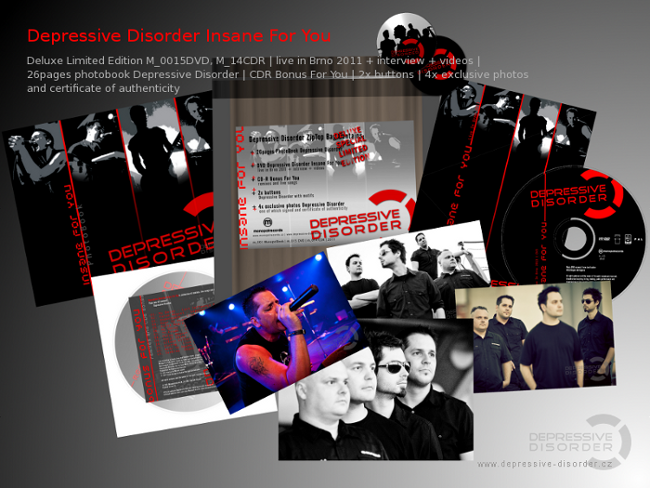 Music website Musicserver.cz, announced a competition for DVD Depressive Disorder "Insane For You". 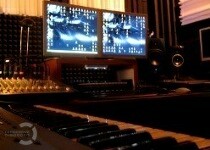 Quiz can fill in Sunday, the 27th November 2011 and sent electronically to editors Musicserver.cz. Contest rules, see ibid. We also plan baptizing of the DVD �Insane For You�. 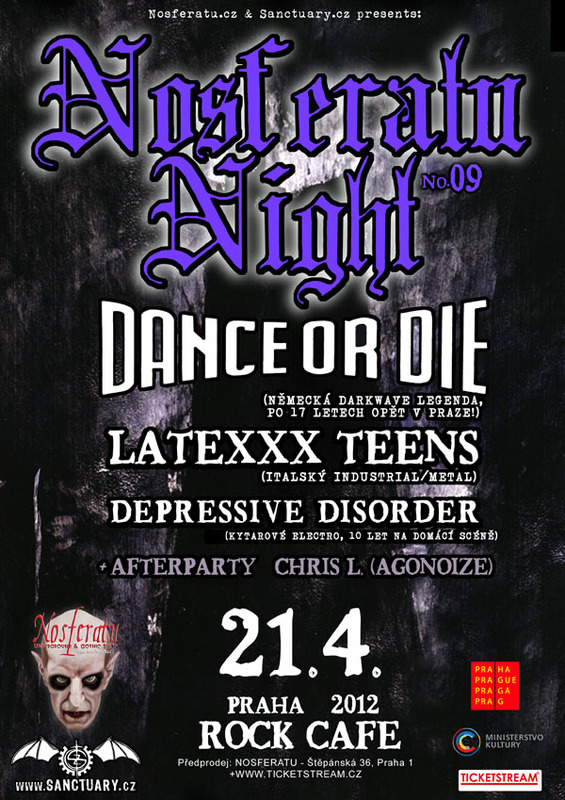 This will happen at Brooklyn club (Brno - Czech republic) Brooklyn on 19.11.2011 � 8:00 p.m. You can buy DVDs and other products of Depressive Disorder there. And you can watch DVD and enjoy electro party. This is not a concert! DVD Insane For You Official release of "Insane for You" DVD, recorded by Jan Kruml and Nova Alternativa on 7.5.2011 at Faval Mucis Circus Club (Brno, Czech republic), is planned on 11.11.2011 under Monopolrecords label. This DVD contains a complete live show including the new Insane single, two videoclips and an interview with the band. Official release of �Insane for You� DVD, recorded by Jan Kruml and Nov� Alternativa on 7.5.2011 at Faval Mucis Circus Club (Brno, Czech republic), is planned on 11.11.2011 under Monopolrecords label. This DVD contains a complete live show including the new Insane single, two videoclips and an interview with the band. Deluxe Limited Edition "Insane For You"
Limited Edition "Insane For You"
DVD Insane For You (live) DVD recorded in Brno on 7.5.2011 (by Nov� Aternativa - Jan Kruml), interview, videoclips. 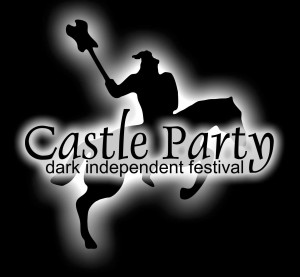 Official press confirmed presence of Depressive Disorder on Dark Independent Festival � Castle Party (27.-29.7.2011) in Bolkow (Poland). Depressive Disorder is going to appear on stage together with Combichrist, Hocico, Leather Strip and many others. More information on the official Castle Party web Castle Party. A new face of Depressive Disorder in a collection of promo pictures by Jan Kruml. V �ervenci byla vyhl�ena sout� o nejlep�� remix skladby "Odlesk tv�j" skupiny Oce�n, kter� se z��astnili i Depressive Disorder. Remix na avizovan� remixov� EP vybr�n sice nebyl, ale je voln� ke sta�en� v sekci Download v pln� audio kvalit�. Avizovan� singl Insane, vych�z� 30. kv�tna 2011 v limitovan� edici, u spole�nosti Monopolrecords, kde si jej m��ete objednat. Tracklist obsahuje: Human Depression (2011), Insane (Single Version), Insane (Serotonin Remix By Cyberdelic Solutions), Insane (Stork's Vision) a Blind (Studio Cut). Ka�d� disk bude um�st�n do r�me�ku se speci�ln�m coverem. Skladba Insane, je z�rove� prvn� skladbou, na n� se pod�l� kompletn� nov� �ty��lenn� sestava Depressive Disorder. Remixov� pohledy na Insane si vzali na starost VeNa (Serotonin Remix By Cyberdelic Solutions) a Radim ��p (Stork�s Vision). Uk�zky skladeb si m��ete poslechnout zde. Hlasujte pro Insane na AlternativaTV! Na port�lu AlternativaTV, kter� d�v� prostor alternativn� kultu�e, byl nasazen 3.6.2011 videoklip Depressive Disorder Insane. B�hem �trn�cti dn�, se z pades�t�ho m�sta dostal a� do TopTen. Shl�dnout ho a hlasovat pro n�j m��ete zde..
V p�tek 27. kv�tna, m�l na Musicserver.cz premi�ru videoklip ke skladb� Insane. Z�b�ry jsou sest�ihem z brn�nsk�ho koncertu, kter� nat��el t�m Nov� Alternativa v �ele s Janem Krumlem pro p�ipravovan� podzimn� DVD. St�ih si vzal na starost Michal Lep��k, ��f Monopolrecords. M��ete si jej prohl�dnout zde. Jak� byla atmosf�ra na koncert� Depressive Disorder v klubu Music Circus Faval, si m��ete prohl�dnout zde. Fotografie zachytili Jan Kruml a Mat�j Slez�k. 4. kv�tna byl na r�diu �esk� rozhlas � Radio Wave v po�adu Dark Wave, odvys�lan� rozhovor s Depressive Disorder. M��ete si jej poslechnout zde. A very special event will take place in Brno! On 7. 5. 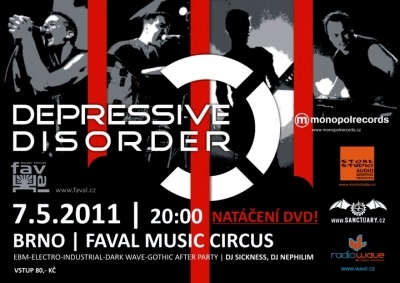 2011 Depressive Disorder will perform a gig at Faval club and ALL will be recorded on professional cameras. The result should be released as a very first LIVE DVD in the history of Depressive Disorder. Don�t miss the opportunity to be a part of it and see the whole new four-member lineup in action! After a year the band�s co-founder Radim ��p returns to Depressive Disorder! The current lineup therefore is: Patrik � vocal; Radim � keyboards, vocals; VeNa � keyboards; Ez � guitar. The band currently work at the new singl "Insane" that should be released in this year�s summer. Two autumn gigs of Depressive Disorder added to the Live section. We're gonna be playing at Strangefest and in Brno - hopefuly some more will come. 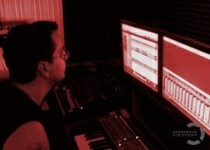 Furthermore the band is working on two brand new songs that will be available on Monopol Records compilation. More info to come, stay tuned for the news! Carpe Noctem Vol.3, 2010 06.05. Concert Depressive Disorder with XIII. Stolet� and The Strange on Carpe Noctem Vol.3, 2010 06.05., Fl�da, Brno, Czech Republic. Info Live. Get ready for a proper dark-electro-industrial-rockandroll! Depressive Disorder will release the new 3" EP -"Back To The Roots edit 1" in March 2010. The CD contains 2 new songs, 2 remixes and a bonus track. Review Depressive Disorder for Sanctuary.cz. Inductiv Industrial Festival, 2010 02. 27. Depressive Disorder with Alvar�z Per�z and Samhein on Inductiv Industrail Festival, 2010 02.27., Subclub, Bratislava, Slovakia. Info Live. Added new promotion Photos by Pilgrime. 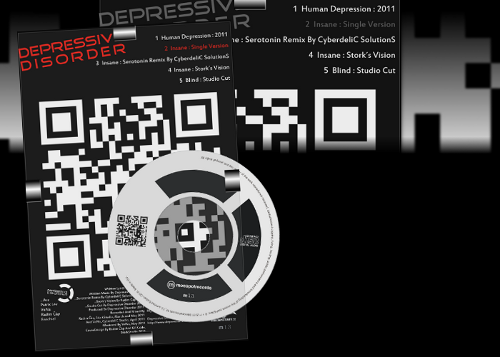 Depressive Disorder participate with remix of track Pawn�Unwarranted Remix for CD Razing Ritual of US project Endless Sunder. Depressive Disorder are currently working on the live show of The Chronicle Of Fear Tour. They will start with shows from January 2010. You will be inform about gigs in the Live section. After a careful consideration we have decided to quit the cooperation with the guys involved in the new live shows preparation. Depressive Disorder will continue with live shows in original two-men line-up. We would like to thank to Old?ich "Olas" Hladk�, Petr "Pedro" Stan?k and Marek Lou?ka for the opportunity to gain new musical experience. 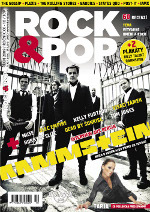 The Chronicle Of Fear review in October release of magazin Rock & Pop. The Chronicle Of Fear album became album of week on Czech music portal Musicserver.cz and album of month on Byelorussian elektro-noise-industrial portal Machinis. You can hear interview with Depressive Disorder on Radio Wave in Dark Wave broadcast, moderated by Pavel Zelinka and Tom� Hoyer. The Chronicle of Fear album was released in 2009.06.29 at Monopolrecords label. The album composed from raw electronics a solid guitars to a dark ambient atmospheres, with typical vocal, these all in eleven songs. Except Patrik and Radim, Olas Hladky from Rhodian band participated on this album as guest guitarist. Album has two releases: The Chronicle Of Fear CD in jewel case packaging (300 copies), and The Chronicle Of Fear CD + CD-R set in special air buble packaging, containing The Chronicle Of Fear CD in jewel case and exclusive CD-R (digipack) Demo 1 + 2 (Near To Death &...Another Step To Death) + Depressive Disorder - button (100 copies). Cover graphical design was made by Monika Sedlarova. 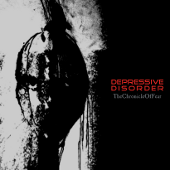 Depressive Disorder have finished new album The Chronicle Of Fear, recorded in StorkStudio. Depressive Disorder were support 2009 04.08. legendary Germany formation Project Pitchfork live in Prague.